Although there are problems in teaching slavery, there are bigger problems in not teaching slavery. Some teachers let their worries about teaching the subject deter them from giving slavery the attention it deserves. When they do, as the filmmaker Ken Burns notes, they participate in making “the great rift” between blacks and whites deeper and wider. Moreover, it’s bad history. Surely slavery, which caused and underlies this rift, was the most pervasive single issue in our past. Consider: contention about slavery forced the Whig Party to collapse; caused the main Protestant churches to separate, North and South; and prompted the Republican Party to form. Until the end of the nineteenth century, cotton—planted, cultivated, harvested, and ginned by slaves and then by ex-slaves—was by far our most important export. Our graceful antebellum homes, northern as well as southern, were mostly built by slaves or from profits derived from the slave and cotton trades. Slavery prompted secession; the resulting Civil War killed about as many Americans as died in all our other wars combined. Black-white relations were the main theme of Reconstruction after the Civil War; America’s failure to let African Americans have equal rights then led inexorably to the struggle for civil rights a century later. Slavery also deeply influenced our popular culture. From the 1850s through the 1930s (except, perhaps, during the Civil War and Reconstruction), the dominant form of popular entertainment in America was minstrel shows, which derived in a perverse way from plantation slavery. Two novels have been by far our most popular—both by white women, both about slavery. Uncle Tom’s Cabin dominated the nineteenth century, Gone with the Wind the twentieth. During the nineteenth century, Uncle Tom’s Cabin was also by far our most popular play, with thousands of productions; during the twentieth, Gone with the Wind was by far our most popular movie (in constant dollars). The most popular television miniseries ever was Roots, the saga of an enslaved family; it changed our culture by setting off an explosion of interest in genealogy, ethnic backgrounds, and slavery. In music, slavery gave rise to spirituals and work songs, which in turn led to gospel music and the blues. Slavery influenced the adoption and some of the language of our Constitution. It affected our foreign policy, sometimes in ways that were contrary to our national interests. Most important of all, slavery caused racism. In the United States, as a legal and social system, slavery ended between 1863 and 1865, depending upon where one lived. Unfortunately, racism, slavery’s handmaiden, did not. In turn, white supremacy, the ideology that slavery begot, caused the Democratic Party to label itself the “white man’s party” for almost a century, into the 1920s. Also during the 1920s, white supremacy led to the “science” of eugenics (human breeding), IQ and SAT testing, and restrictions on the immigration of “inferior races” from southern and eastern Europe as well as Asia and Africa. Obviously, then, because of its impact throughout our past and in our present, we must teach about slavery. The question is how. The first step in introducing a unit on slavery is to help students see slavery’s relevance to the present. If not for slavery, people from Africa would not have been identified as a race in the first place, let alone stigmatized as an inferior race. Race as a social concept, along with the claim that the white race is superior to other groups, came about as a rationale for slavery. As Supreme Court Justice William O. Douglas famously put it in 1968, racism is a vestige of “slavery unwilling to die.” This is terribly important for students to grasp, because otherwise many of them (and not just black students) imagine that racism is innate, at least among white folks. The next step is to hold a conversation about racism. Many students of all races—in both high school and college—are unsophisticated as to what racism is and where it comes from. In the past few years, racism has come to be considered socially unacceptable, at least in interracial settings. That’s a welcome development, because it is both unfair to individuals and bad for our nation to treat people unfairly on the basis of their racial group membership. Many Americans think people are “naturally” racist or that at least white people are. I have heard college professors, social scientists, and lawyers say that whites are racist by nature—that is, genetically. Nonsense. No one is born with the notion that the human race is subdivided by skin color, let alone that one group should be dominant over others. Racism is a product of history, particularly of the history of slavery. Racism was an historical invention. Racism is thus neither innate nor inevitable. Students must never be allowed to say that it is without being contradicted—preferably by other students. Of course, showing how racism developed to rationalize slavery does not mean that whites adopted the idea consciously and hypocritically to defend the otherwise indefensible unfairness of slavery. Whites sincerely believed in racial differences. Indeed, between 1855 and 1865, white supremacy in turn prompted the white South to mount a fierce defense of slavery. During the Nadir of race relations—that terrible period from 1890 to about 1940, when the United States was more racist in its thinking than at any other point—whites used racism to justify the otherwise indefensible unfairness of removing blacks from citizenship. Slavery was not always caught up with race. Europeans have enslaved each other for centuries. The word itself derives from “Slav,” the people most often enslaved by their neighbors before 1400 because they had not organized into nation-states and could not defend themselves adequately. Native Americans and Africans likewise enslaved their neighbors long before Europeans arrived. Ethnocentrism—the notion that our culture is better than theirs—has long existed among human groups. Perhaps all societies have been ethnocentric. Saying “we’re better than they” can rationalize enslaving “them.” But then the enslaved grow more like us, intermarry with us, have children, and speak our language. Now ethnocentrism can no longer rationalize enslaving them. Although there are problems in teaching slavery, there are bigger problems in not teaching slavery. One way to show the development of racism is through Shakespeare’s play Othello. Shakespeare wrote the play in 1604, but it derives from a story written down in 1565 by Giovanni Battista Giraldi but that probably dates back still further. Giraldi and Shakespeare considered Othello’s blackness exotic but not bad. European nations, beginning with Portugal in the middle of the 1400s, had already begun to enslave Africans. Eric Kimball explains in his essay in this volume that Europeans at this time stopped enslaving Slavs and instead picked on African villages, avoiding those Africans who had organized into nation-states or enlisting them as allies. Black slaves came to be seen as better than white slaves, who could more easily run away. By 1600 most slaves in Europe were black and most blacks in Europe were enslaved, so slavery began to be seen as racial. 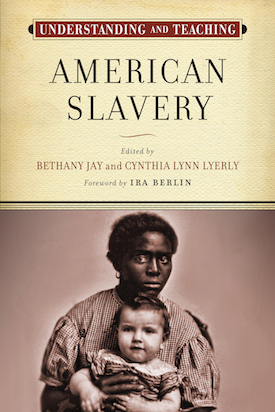 Since their color still identified them as slaves even after they had acculturated to “white” society, it seemed appropriate to keep Africans’ children enslaved. Racism increased as this “new” slavery intensified. By 1700, white slave traders were carrying thousands of Africans every year to Brazil, the Caribbean, and the southern United States, where they and their children would work, unrecompensed, forever. How many slaves came to the British colonies and later the United States? How did slavery affect US foreign policy? What were slaves' lives like? How did people respond to enslavement? Why were there fewer slave revolts in the United States than in Haiti, Jamaica, Brazil, and elsewhere in the Americas? Was slavery ending by 1860? How did the monetary value of slaves compare to other investments in the United States? After generating an overall question list, students can examine their textbook to see how it measures up. If they feel it answers their questions, wonderful! Let them work together to uncover the answers. I suspect they will find that it doesn’t. In that case, teachers must help them to go beyond the textbook and learn more about slavery and its impact on their own. 3) Click the “Update” button.